Ralph & Terry Kovel, ©1998, Hardcover, 10 1/2 x 8 1/2 in., 224 Pages. 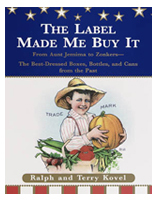 When Ralph and Terry Kovel started collecting labels, they learned that every label is an ad and a mystery. A label is designed to catch your eye, entice you to buy, tell you what the product is, why it's wonderful, and even if it's good for you. But if you learn to read clues on a label, it can tell you much more--who made the product, when it was made, and the consumer laws that governed its packaging, as well as the fashions, hairstyles, humor, prejudices, pleasures, and political ideals of the past. The Label Make Me Buy it shows you the clues to look for. Who made the product, when it was made. It includes historical information about label makers and food companies, as well as listings of patents, dates, legal wording and lithographers. Tobacco, citrus fruit, food labels, firecracker packages and product stickers are eagerly bought, sold, and traded through auctions, shows, organized clubs and on the Internet. The labels in this book range from salmon and tomato labels of the 1860s to frozen pie labels from the 1970s. The products include tobacco, citrus fruit, candy, firecrackers, fabrics, and canned goods. Many show mouthwatering images of the foods we love or emotional representations of the childhood we remember.